The great Italian writer gets her due in this short but captivating biography. Oriana Fallaci (1929-2006) played a unique role in international journalism in the latter half of the 20th century. She wrote, talked, and smoked furiously, and she wasn’t afraid to get in the face of the rich and the powerful. She grilled Secretary of State Henry Kissinger about Vietnam, eliciting a quote describing himself as a lone cowboy that he regretted forever. Fallaci didn’t suffer despots gladly; she called Haitian dictator Jean-Claude Duvalier an idiot to his face, and she defied the Ayatollah Khomeini by removing her head covering right in front of him. In her first book in English, Italian author and journalist De Stefano captures the sheer intensity of Fallaci’s personality, both personally and professionally, and where it came from. She grew up working for the Italian resistance and matured into a woman who judged everyone, including herself, by the quality of courage. She was unforgiving of slights in friends and especially lovers; once it was over, there was no going back. She wasn’t bogged down by inconsistencies; she was an ardent feminist who had mixed feelings about abortion and could become completely subservient to the men in her life. She hated authoritarianism but despised puritanical leftism. She was an unswerving atheist who admired and befriended Pope Benedict. After 9/11, Fallaci alienated liberals by becoming an unswerving Islamophobe. “The need to oppose fascism, of any type, on the Left or on the Right, is her line in the sand, the measuring stick with which she judges people and governments,” writes the author. 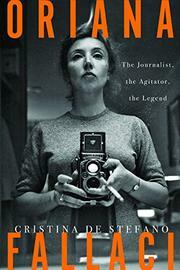 Although favorably inclined toward her subject, the book is not a hagiography; De Stefano diligently attempts to reveal all sides of a complex and brilliant figure. Fallaci left an enormous body of work, both journalism and fiction, and the future may demand a more definitive assessment of a long and productive career. But for now, this is a superb introduction to the life of an irreplaceable figure.